This week, we were invited back to a completed Countertop Project to sneak a peek at the finished results! And boy, were we in for a treat. Davis Islands has long been an elegant neighborhood in the Downtown Tampa area. 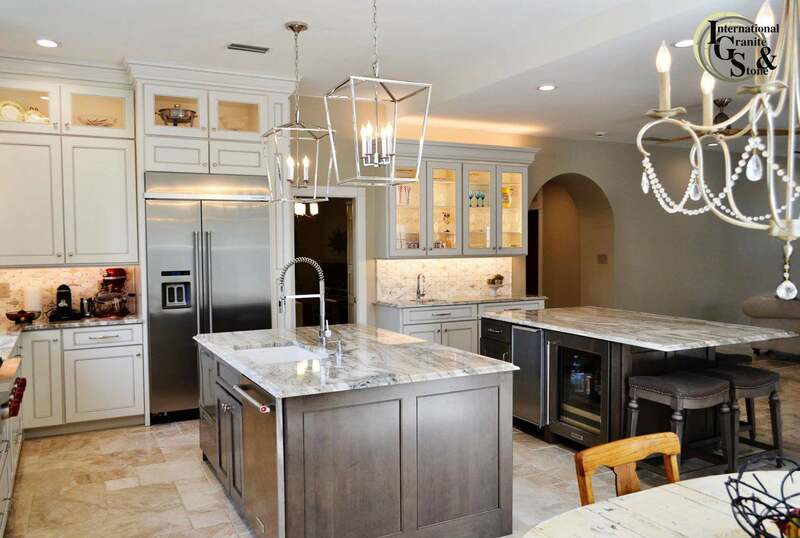 Nestled by the water, the Warren family purchased their home in Davis Islands about a year ago, with their dream kitchen in mind. The Islands rich history was very important to the Warren family. Established in the 1920’s Davis Island was built by D.P. Davis. Built atop two man-made islands, Davis Islands is considered an archipelago, due to a canal separating the two main islands. Although the Peter O’Keene Airport technically sits atop a third island, the third island was connected to one of the other islands, to build a straight runway for the planes. It took close to 100 million cubic feet of sand from the Bay to build up and forge Davis Islands. The Warren’s started work immediately on their Dream Kitchen, with knocking out walls, gutting the old kitchen and the old worn out countertops. 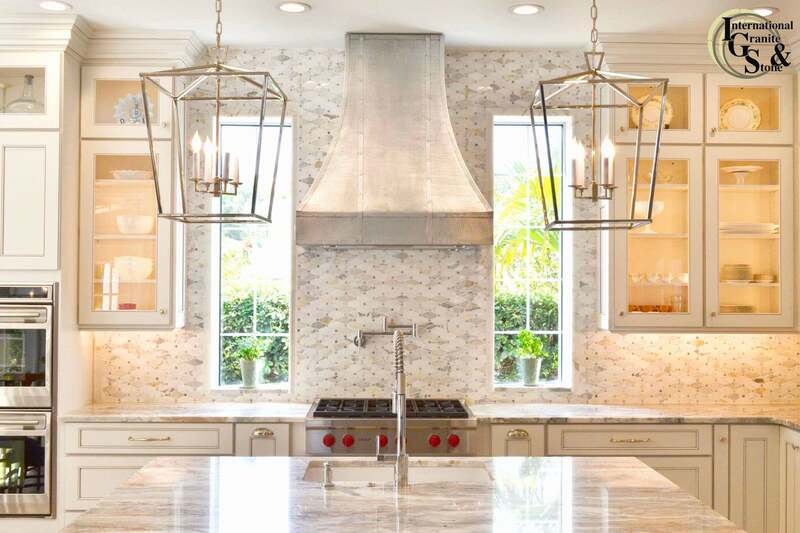 While working initially with designer Enrique Encresto, the Warren’s drew inspiration for their kitchen countertop project from finding Pictures on Pinterest and houzz.com of many colors of natural stone. 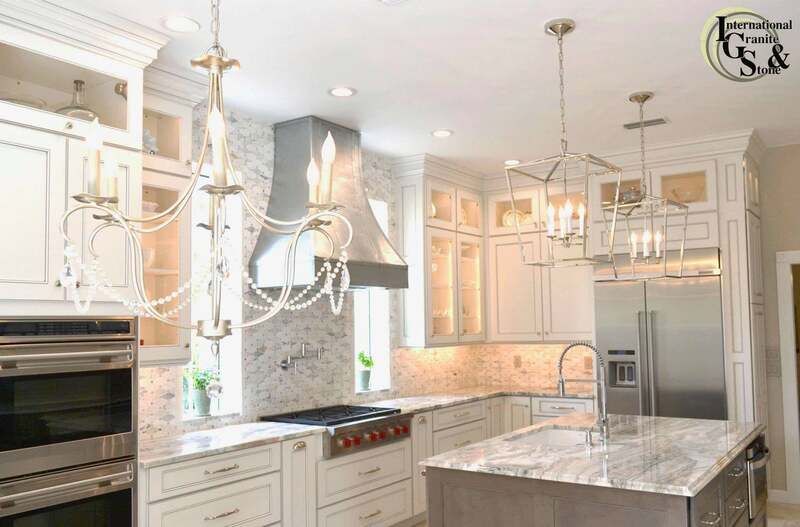 With the Demolition and drywall process completed, the Warren’s called International Granite & Stone to help them out with their Kitchen Countertops. After much deliberation with IGS Design Specialist Jessica A., The Warren’s decided on a gorgeous slab of Brown Fantasy. Brown Fantasy is a natural stone quartzite countertop. Quartzite is often preferred for its durability, as it is significantly stronger than Marble and tougher than Granite. Due to its natural stone properties, we recommend sealing the quartzite to make sure the stone won’t absorb any liquids and cause stains. Brown Fantasy Quartzite features a white/gray background, with swirls of black, taupe and cream with hues of blues and greens. 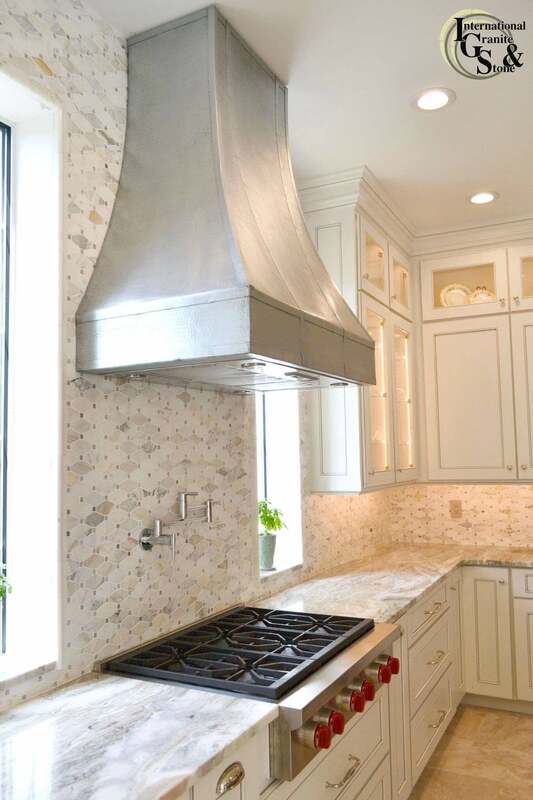 “Sometimes you just need that woman’s touch.” Mr. Wall’s girlfriend said, “I won out on this decision, the Backsplash is my favorite part!” she beamed. Quartzite is a Natural Stone, formed under the Earth. This Natural Stone is similar to the durability of Marble. Quartzite Countertops are known for their beautiful waving movements and gorgeous color patterns. Unlike Marble, which is mainly found in whiteish colors, you can see variations of Reds, Oranges, Greens, and Blues throughout Quartzite Slabs. As Quartzite is a Natural Stone, no two slabs are completely the same. 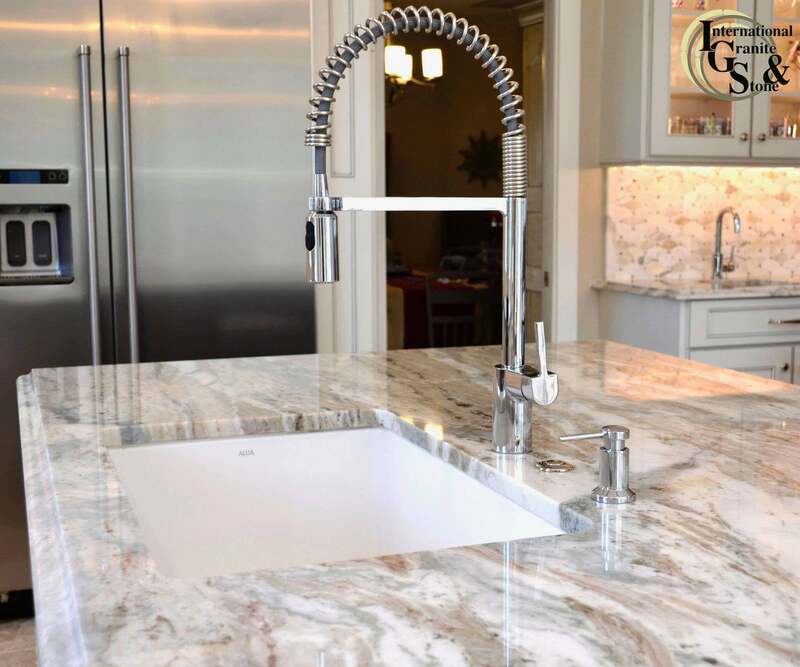 At International Granite and Stone, we offer a Digital Slab Layout option, which would include a digital markup of what your countertop arrangement would look like. This is crucial for Natural Stone Countertops, to ensure you are completely satisfied with how your stone is being arranged. Once your job has been templated, the slabs of stone we are going to use for your project are ordered. Once they arrive, the purchased slabs then get photographed and uploaded onto special computer software where the template is then superimposed directly on top of the slab and arranged into your kitchen dimensions. With an In-Home Appointment and Jessica A.’s Help, The Warren Family Chose Brown Fantasy Quartzite, for Its Durability and Style. Where to Buy Brown Fantasy Quartzite in Tampa?